Polished crystal ghost pendant. 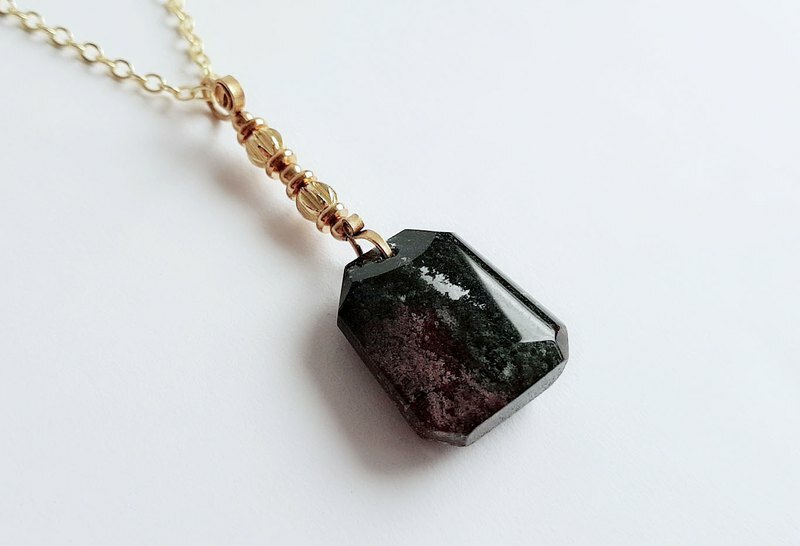 Natural minerals are dark and dark green. Pure crystals. Contains volcanic mud minerals. Https://farm2.staticflickr.com/1959/44556149915_8bec5ec2a6_c.jpg Https://farm2.staticflickr.com/1968/31595530428_dfec03df25_b.jpg Https://farm2.staticflickr.com/1937/43653125270_fe1d7699a2_c.jpg Https://farm2.staticflickr.com/1952/45418772592_be72d1f0a5_b.jpg There is a gem "Ghost Crystal" in nature. It contains not only living creatures, it can contain everything in the world. Ghost crystal is also called phantom crystal. Ghost crystal refers to the process of crystal growth, Because of minerals such as volcanic mud, in the transparent white crystal, Various natural visions such as clouds, plants, vortexes and even pyramids emerge. Therefore, there will be a variety of ghosts in various poses. Its main feature is the inclusion of some volcanic marl and other mineral inclusions. Most well-known is the green phantom crystal, which contains green volcanic plaster and is known as the green ghost. By the same token, due to changes in the color of volcanic marl, It will also form red ghost, white ghost, purple ghost, blue ghost, gray ghost crystal. If it contains the inclusions of various colors, it is called "vision crystal", "phantom crystal" or "color ghost". "Vision Crystal" and "Phantom Crystal" have their own special energy magnetic field. Because the interior of the crystal is containing minerals or volcanic plaster, They are all quintessence of high temperature and high pressure after tens of millions or hundreds of millions of years. So in contrast, the energy of the crystal is quite strong. "October Crystal" and "Phantom Crystal" energy stone, the spar shows a pointed pyramid of crystals inside. The crystals are layer by layer, such as landscapes or illusory shadows. This spar continues to re-grow and stop growing, hundreds of millions of years of experience ~ Such stored energy can change the stagnation of things, Thus guiding us to overcome the difficulties in our life, and bring about growth in body and mind. It also has the treatment of emotional pain and is an energy stone that promotes the body's metabolism. Because it is a very high frequency spar, it has strong protection and conversion. It can block negative energy outside the gas field and prevent energy from escaping. Reconciling and correcting the magnetic field energy of the body to raise the level of subconscious or deep subconsciousness, Stabilize the energy in the body, Combine the wisdom of rational knowledge and intuition, and be able to understand the spiritual purpose (developing the third eye). Https://farm2.staticflickr.com/1957/31595530148_d45cc48028_z.jpg Https://farm2.staticflickr.com/1927/44556149225_d45cc48028_z.jpg Https://farm2.staticflickr.com/1912/43653124810_8e1aec6417_z.jpg Https://farm2.staticflickr.com/1902/44556148935_7003c3976b_z.jpg Https://farm2.staticflickr.com/1927/31595529448_c85190f5e8_c.jpg Https://farm2.staticflickr.com/1947/30530028217_e71f63ebbc_c.jpg Green ghost Green Ghost (Green Phantom) Crystal Phantom, The main business can strengthen the personal career and wealth. If you use the crystal of Zhengcai, the green crystal is mainly represented by it. The positive wealth highlighted here includes all good luck, good opportunities, good friends and even nobles to help. But the meaning of Zhengcai is more justified by hard work. Under the same efforts, You can get more rewards or gains, which is different from the partial wealth represented by yellow crystal. Green Ghost Crystal is unique to recruiting people. The magnetic field emitted can attract you to help, especially for careers. For new jobs or new careers, or for people who often work in the field, it is more suitable. 1] Green ghost corresponds to the heart, the main Zhengcai, is the first choice for the pursuit of wealth friends. 2] Wearing a green ghost can eliminate the depression, troubles, and make people have a happy mood. 3] Green energy is a lucky energy, often worn to improve its own luck. Https://farm2.staticflickr.com/1970/30530030017_30cb49f1e5_z.jpg Https://farm2.staticflickr.com/1904/44556148465_b016f537e7_z.jpg Https://farm2.staticflickr.com/1941/43653123930_3f51f61772_z.jpg Https://farm2.staticflickr.com/1937/30530029607_3130699747_z.jpg Https://farm2.staticflickr.com/1912/44556147645_fe00459b50_z.jpg Https://farm2.staticflickr.com/1946/44745257324_80cd1d6468_z.jpg Https://farm2.staticflickr.com/1945/43653123650_3001676f82_z.jpg Https://farm2.staticflickr.com/1902/30530029017_db82ea3dff_z.jpg Https://farm2.staticflickr.com/1962/44745257614_21d6675df1_z.jpg [ product features ] Polished crystal ghost pendant. Natural minerals are dark and dark green. Pure crystals. Contains volcanic mud minerals. It accommodates everything in the mountains and rivers. Such as water plants in the stream. Growing plants. The color is not as beautiful as tropical plants. But there is the true nature of simplicity and perseverance. Natural texture on the back. A little bit of a small feeling. Material: natural ore Green ghost Brass size: Green Ghost Ore: Length 23mm Width 20 mm Thickness 9.5mm Train length: about 28~29 centimeters (take a circle to measure) and put it on the chest. Https://farm2.staticflickr.com/1904/44556147225_14c79f44af_z.jpg Https://farm2.staticflickr.com/1933/30530028567_d8f8511f58_z.jpg Https://farm2.staticflickr.com/1941/30530028027_1cfff7ee43_z.jpg [ Precautions ] 1. Natural minerals should avoid exposure to sunlight, high temperatures, and hard objects. It is not advisable to wear jewelry when going to the beach, sunbathing, hot springs, etc. And keep the water, occasionally placed in the water, keep it moist, Usually wear to play with contact friction, human sebum can be used for its internal structure, It plays a certain protective role, making the natural ore more shiny and beautiful. 2. Maintenance of jewelry. When not wearing properly, you can put it in a zipper bag for collection. Wipe with a silver cloth. Or remove the toothpaste. Drain the water after washing. 3. The color may vary depending on the screen of each monitor. There will be a slight color difference. Please consider above. 4. Photographs and introductions of the products in the museum. The status of the goods has been described as much as possible. If you want to know. You can contact us.